1. Solutions should be accurate, and volume loss or change due to the numerical schemes and procedures should be minimized and acceptable. 2. Intelligent meshing or remeshing capabilities should minimize solution inaccuracies during remeshing and smoothing state variables. 3. Optimized or adaptive meshing density capabilities should be adopted to obtain a solution within a reasonable computational time and without solution inaccuracy. Also, one should be able to successfully mesh complex geometries. 4. Characteristic boundaries (or edges) and workpiece-die interface boundaries should be accurately traced during simulation and remeshing to minimize changes in the boundary value problem due to remeshing. 5. 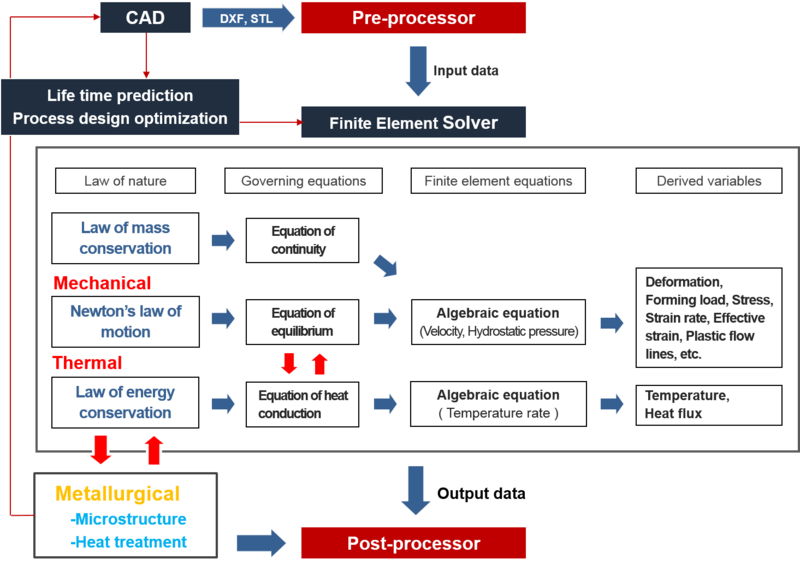 Multi-stage BMF processes (especially multi-stage forging processes) should be simulated automatically to reduce the total simulation time (including both computational time and user processing time between the stages). 6. The simulator should be convenient and user friendly. 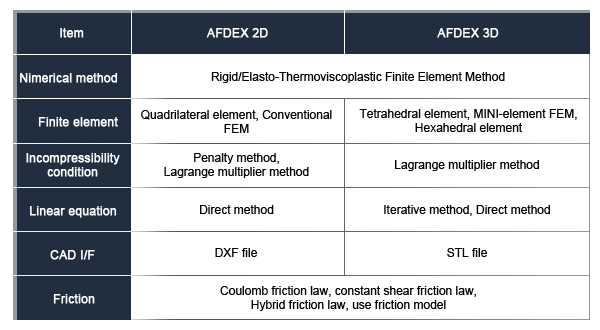 Currently, AFDEX is theoretically based on the rigid- or elasto-thermoviscoplastic finite element method. There are a number of modules. AFDEX 2D and AFDEX 2D/DIE use quadrilateral finite elements. AFDEX 3D, AFDEX 3D/OPEN, and AFDEX 3D/DIE employ tetrahedral elements. 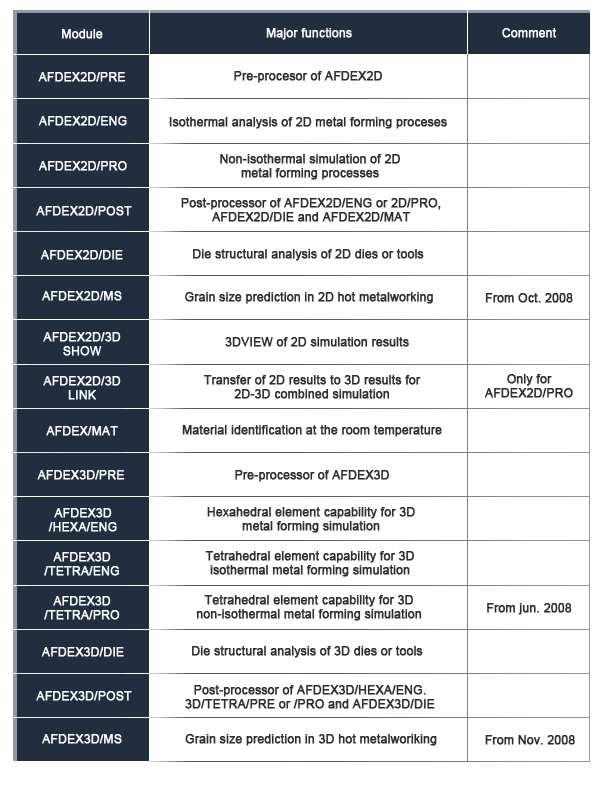 AFDEX 2D/DIE and AFDEX 3D/DIE are integrated die structural analysis programs that accompany the respective BMF simulators, AFDEX 2D and AFDEX 3D. AFDEX MAT provides users with highly accurate true stress-strain curves for the materials in use at room or elevated temperature. AFDEX 2D/3D allows combined 2D and 3D simulations to be carried out, and permits 2D results to be more vividly visualized via a powerful 3D computer graphic utility. AFDEX DB provides material and process information, including flow stresses, forming machines, and the like. Flow stresses for most commercial materials are available with a wide range of state variables, including temperature, strain and strain-rate. AFDEX Web is a special web version of the simulator that can be used online by small or large academic, commercial, and research communities. Of course, all AFDEX developers are doing their best for AFDEX to satisfy the aforementioned requirements for intelligent MFS. In what follows, characteristics and typical applications of AFDEX are discussed in terms of its intelligence.